Eco-driving : Technology serving sustainable development. A tracking device is installed in the vehicle. It is remotely configured with an Eco-Driving Profile. For every exceptional event (harsh braking, hard acceleration, speeding, etc…) a report is sent to a server. At the same time the driver is notified of his infraction by a buzzer (which the volume is configurable). The fleet manager is informed of all violations via reports which can be in real-time, scheduled or upon request. All information can be viewed on a secure web-based platform. Detailed analysis of the results can be presented to the drivers to highlight any issues and implement actions plans. 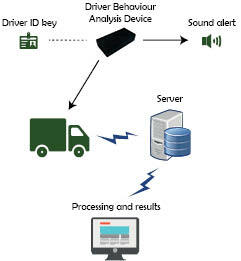 Monitor your drivers’ behaviours remotely in real-time. Highlight positive and negative aspects at a glance thanks to a meaningful rating system. Help drivers to improve their performance via an in-cab buzzer. Monitor their performance on a daily basis.